Greece lies in the heart of the Mediterranean region that has inspired the famously healthy Mediterranean diet. This diet is based on the traditional foods and meals of Greece, Spain, southern Italy, and specifically the Greek island of Crete, and parts of the Middle East. This derived diet is based on high numbers of plant foods, fresh fruit eaten as desserts, olive oil as the principle source of fat - used for cooking and dressings, dairy products (mostly yogurt and cheese), both fish, seafood and poultry eaten in low to moderate quantities, small consumption of red meat, less than fours eggs eaten each week weekly, and wine with food in low to moderate amounts. The total amount of fat in this diet is about 25-35% of calories. Saturated fat is less than 8% calories. While vegetables, herbs, grains, olives (and their oil), fish and seafood remain the fundamentals of Greek cuisine served at restaurants, diners should beware of the high calorie and high fat dishes that are included on many menus. Serving sizes can be large and cheese such as feta and large quantities of olive oil can quickly inflate the calories and fat contents or otherwise healthy dishes. This article will show you how to make healthy choices when eating out at Greek restaurants. There is also a comprehensive calorie chart for common Greek foods and dishes. Souvlaki - are kebobs made of lamb, chicken or pork. They can offer an excellent low- fat and low calorie option as they are loaded with healthy vegetables. However watch the portion size and be careful of the sauces. A Chicken souvlaki typically has about 260 calories per serve and 8 grams of fat. Lamb or pork souvlaki have slightly more calories and fat ( 310 calories;11 grams of fat). When eating these dishes avoid the trap of cheese and oil laden salads and the temptations of. large servings of pita bread or rice. 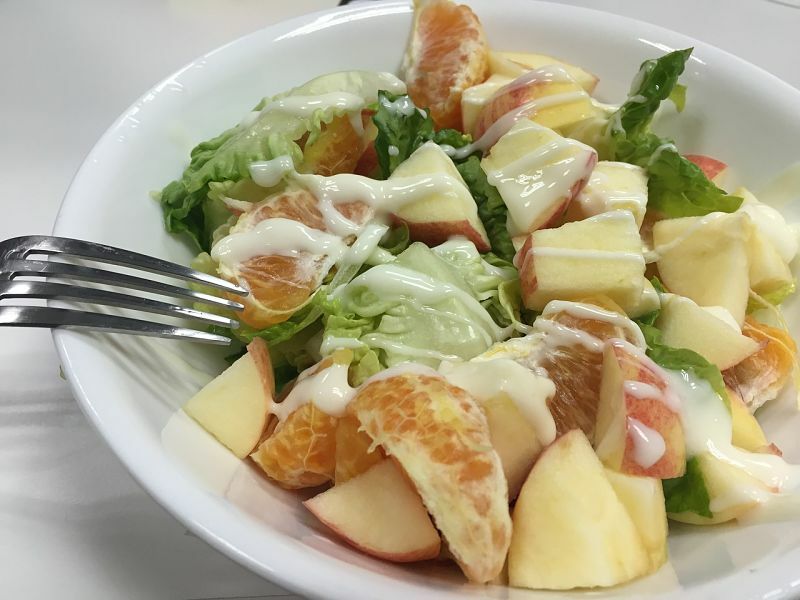 Try to order steamed vegetables or a healthy side salad without cheese or oil-based dressings. Greek salads -Salads, despite their general reputation, are not always a healthy option for the diet conscious diner, because the traditional salads are often laden with cheese and oil in the dressing that can inflate the calories dramatically. 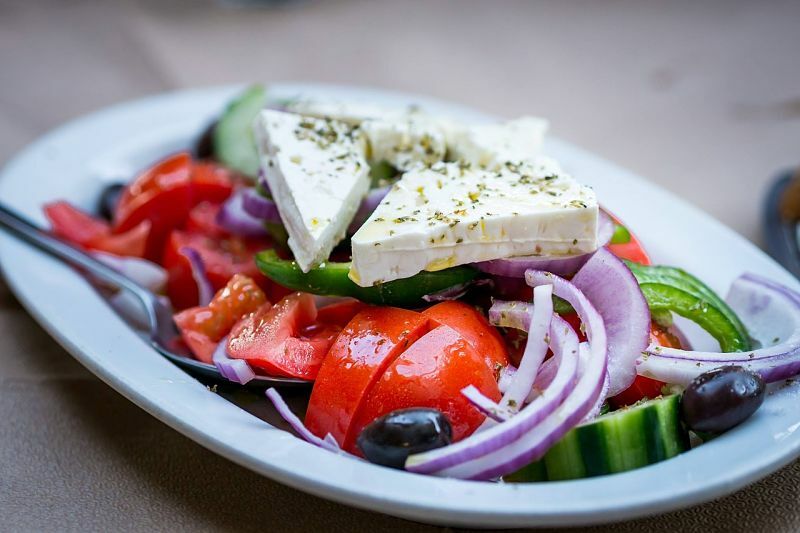 If you order a Greek salad, ask for no oily dressing and no feta, which is fully of calories and saturated fats. As an alternative, ask for a side of tzatziki sauce - healthy Greek yogurt that is flavored with garlic and cucumber. The addition of a little grilled chicken or seafood can boost your protein intake without adding too many extra calories. Melit Janosalata - This is a dip of garlic, ground eggplant and olive oil, that provides a great source of healthy ingredients with minimal calories. Ask for extra vegetable pieces on the side for dipping rather than pita bread (or half and half). Hummus - is a chickpea-based dip that includes garlic, tahini (sesame seed oil), olive oil, lemon juice and a mixture of various spices. Hummus comes in a variety of flavors, depending on the restaurant, including spinach, grilled red pepper, eggplant, artichoke and roasted garlic. Chickpeas are very rich in protein and are a good healthy choice, with a glycemic index of 12. This means hummus will satisfy your appetite for a good while without the need for extra calories. Order fresh vegetables for dipping rather than bread which reduces the calories. A tasty common menu item is hummus with warm pita bread, tomatoes and cucumbers. Kakavia Soup - This traditional Greek fisherman’s soup is usually made with local fresh fish (catch of the day), and a range of other seafood items such as lobsters, shellfish and shrimp for added flavor. This soup is generally pack with a variety of healthy chopped vegetables and herbs. This soup is a low calorie and low fat source of vitamins and antioxidants. 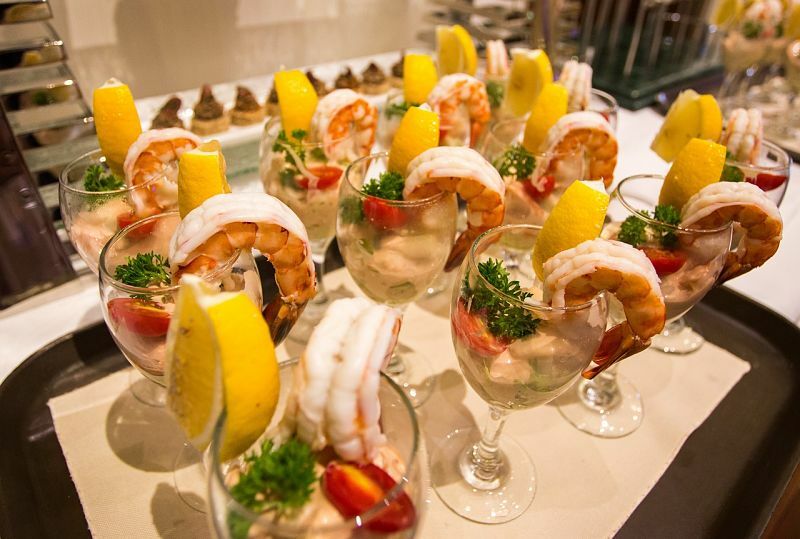 Seafood Dishes - Since Greek food is founded on the shores of the Mediterranean, many Greek restaurants offer a variety of seafood meals and dishes. Look for dishes that is grilled, broiled, pan seared BUT not fried. Request side serves of fresh vegetables, healthy salad and dips with small bread servings. Avoid the sauces which can be laden with unwanted calories and fat ( order tzatziki sauce instead). Avoid eating large servings of bread or rice with your fish, which can double the number of calories to your meal. The following list provides a guide for making healthy choices from the menus. CHOOSE: Tzatziki Dip with Pita (220 calories, 5 g of fat, 3 g of saturated fat, 430 mg of sodium). Choose the version made from yogurt, garlic and mint, not sour cream, which can easily double the fat and calories. CHOOSE: Whole-Wheat Pita Bread, 180 calories, 5 g of fiber; rather than the white variety. AVOID: Greek Salad with feta and heavy dressing (215 calories, 15 g of fat,4 g of saturated fat, 557 mg of sodium). 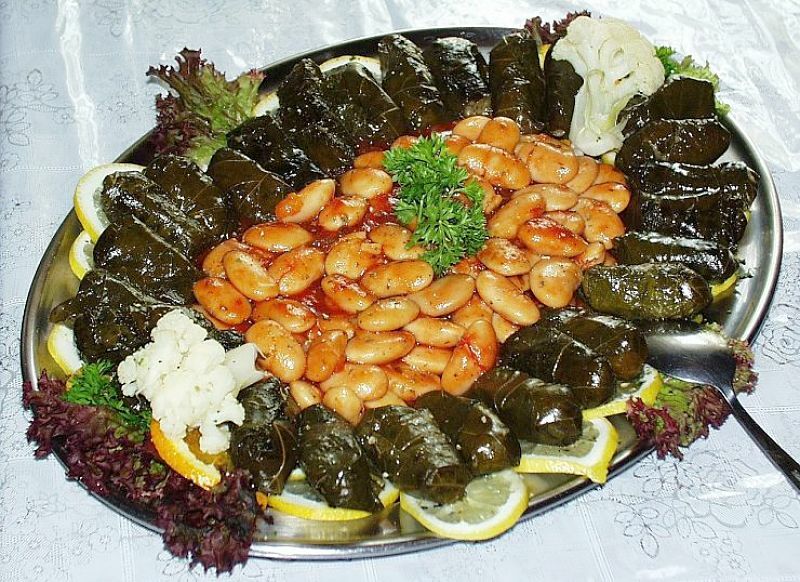 AVOID: Dolmades (with are grape leaves stuffed with ground meat and rice) (540 calories, 32 g of fat, 15 g of saturated fat, 1,470 mg of sodium).The ground lamb or beef stuffing has lots of saturated fat, the rice adds calories and brine has a high sodium content. CHOOSE: Chicken Souvlaki (260 calories, 8 g of fat, 2 g of saturated fat, 370 mg of sodium). Pieces of chicken, pork, beef and lamb are marinated - grilled and usually served with grilled vegetables and rice. CHOOSE: Share two traditional dishes between four people and add healthy side salads and small bread servings to cut down on the calories. AVOID: Spanakopita (410 calories, 24 g of fat, 12 g of saturated fat, 730 mg of sodium). This dish consists of sheets of phyllo dough that are coated with butter and filled with a mixture of spinach, oil, feta and eggs. Very tasty but very heavy and unhealthy. AVOID: Gyro (760 calories, 44 g of fat, 20 g of saturated fat, 2,390 mg of sodium).This is pita bead filled with a mixture of ground meat (roasted and seasoned beef and lamb), bread crumbs, tzatziki, feta, lettuce, onion, garlic and tomatoes. Generally OK but comes in huge serving sizes and the meat has too much fat and too many calories. OK to share with a friend. CHOOSE: Fresh or dried fruit dishes with yogurt - generally about 100 calories per serve.